Why Leave All That Learning Only in Your Head? So many educators reading so many books that impact their practice! 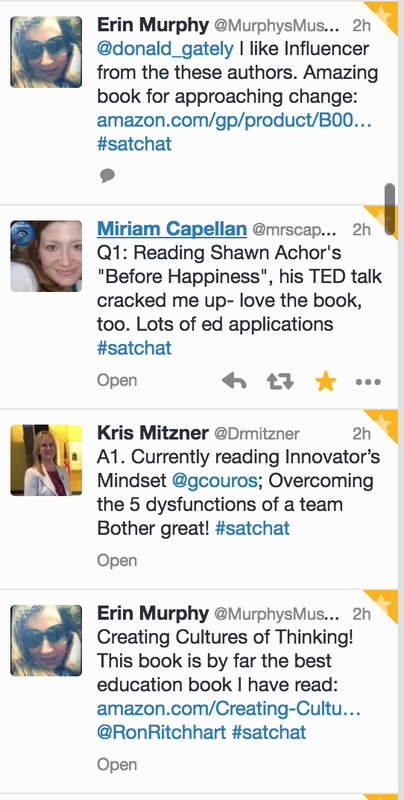 That was my takeaway from #satchat this morning, and #ontedleaders last week as we were challenged to share the reading that was impacting our work at this time. I can’t possibly read all of those books, but my colleagues in my PLN have made me so curious about what is in those books and how it might impact my thinking! What if we all just blogged about o ur reading? We ask students to write book reports. Why don’t we model the importance of sharing our learning in an open, searchable, collaborative way? If we read a chapter, then reflected, summarized and shared, with appropriate tagging, how could we impact student learning as a community? Thank you to those already doing this, such as Stacey Wallwin (@WallwinS) and Brenda Sherry (@brendasherry). If you haven’t considered it, OSSEMOOC can help you get started with creating a blog. and with viewing the blogs of other educators as examples. As you think about your own PLN, consider what you are learning, AND what you are contributing to the learning of others.